“Killing Maine” eBook was published in 2015 and was written by Mike Bond (http://www.mikebondbooks.com). Mr. Bond has published six novels, this being his second in the Pono Hawkins series. I received a galley of this novel for review through https://www.netgalley.com. I categorize this novel as ‘R’ because it contains Mature Situations and Mature Language. This Mystery Thriller novel is set mostly in contemporary Maine. The primary character is Sam ‘Pono’ Hawkins, a former Special Forces soldier and now a surfer and occasional writer. He is contacted by a former girlfriend, Lexie, to come to the aid of her husband, Bucky. The wind power industry (who Pono confronted in “Saving Paradise” in Hawaii) has come to Maine. Bucky is being held for having shot up wind turbines and killing a local environmentalist promoting the wind industry. But Bucky swears he is innocent of the murder. Pono leaves for Maine to see if he can help Bucky. As he investigates, he finds himself the target of the local police. Pono is shot at and nearly killed himself. 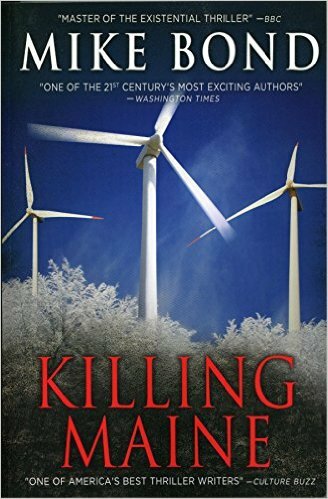 The killing does not stop with the environmentalist, and soon Pono is the prime suspect for further turbine shootings as well as a murder/arson. Pono finds evidence of corruption by Maine officials and wind power companies. Things are more complicated when Pono hears from this father. His father is near death from cancer, with little time left. Pono makes intimate relations with two women he meets during his investigation, though he is not always sure which side they are truly on. This 388 page novel gave me 10 hours of reading. The mystery aspect of the story was interesting, but I found the constant anti establishment, anti government, anti wind power sentiments annoying. Certainly the wind power conspiracy was key to the story, but the repeated expression of animosity made the story more of an environmental/political call for action. The story was never dull (if you ignore the anti-wind power speeches) and that saved the story. That said, i am not sure if I will read another of Bond’s novels. I give this novel a 3.8 (rounded up to a 4) out of 5.